“God had allowed this tragedy to occur for a special reason. He knows everything that is going on in this world. He is the One who can answer all the questions you need to ask. I am your Mother who prays, loves and cares for all my children in the world. You must also realize that God, in His ways, protected those souls. I took care of my little children under my mantle.” Please continue to pray for their souls and to offer masses for them. Emma: While our Mother was talking, there were tears on her face. I felt Her love and concerns for all of us, and at the same time, I also felt Her sorrows. 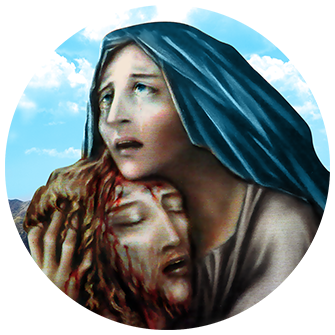 I cried so hard because I did not want to see Blessed Mother crying, that I asked her to stop crying. I said, ‘What can I do Mother, to console your sorrows?’ I did not care if I died at that time; I only wanted to be worthy to remove Her sadness. Blessed Mother did not speak. “We ask our brothers and sisters to carry your Mother everywhere you go. Bring her picture or statues of any size and share them with the people. This is Mary, who is full of grace. This is the Mother of Jesus Christ, who is Our Lord. She is the Mediatrix of all grace. Emma: Then she disappeared, followed by the saints and angels.